This article was written for and originally published in the The Low Country Today, Charlston, SC. Used with permission. He is a modern day troubadour, a well respected singer songwriter, part poet, part crooner, and one of Canada's most prolific and enduring musical exports. For over 55 years Canadian born storyteller Gordon Lightfoot has been entertaining fans with his signature voice and memorable music. No stranger to piano or drums it has been his guitar work coupled with iconic hit songs from the 1960's and 70's that have garnered Lightfoot legions of fans. Lightfoot's gentle mix of folk, rock, and country music have earned him just about every music award Canada has to offer along with numerous Grammy nominations as well as gold and platinum albums. Signature songs such as "If You Could Read My Mind", "Sundown", and "Wreck of the Edmund Fitzgerald" solidified his place in music history. All totaled he scored five number one songs on various charts in the U.S. and 13 songs on the American Top 40 charts. 76 years young it has been a long journey for Canada's legendary musical ambassador. "I've enjoyed by my life. There have been a couple of bumps in the road here and there but all in all it's been a pretty good life." After five decades of touring Lightfoot could easily hang it up. "I still enjoy performing. I have a good base of followers who like to come out and see me play and I like playing my songs for them." Although he's had a few medical concerns over the years Lightfoot does his best to stay in shape, making touring easier. "When I'm home I get in as much exercise as possible. It's not as easy to maintain the workout regimen when I'm on the road because our schedules get thrown off." He admits to keeping a regular cycle when it comes to home and touring. "We might go out and do eight to 15 shows and then we head back home. Maybe we're off for a couple of weeks or a month and then we're right back at it." Lightfoot and his band perform roughly 75-80 shows a year. "Last year was a banner year for us. We did 91 shows. I have a good group of guys that play and travel with me." 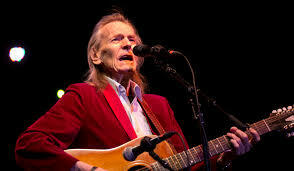 As long as he and they remain healthy Lightfoot will keep going. "I lay everything out in two year intervals. We schedule our tour and festivals we're going to take part in over two years. After that I re-assess and see how we're all doing and if we want to keep at it." His tours usually end with the band playing Toronto's famed Massey Hall. "It's one of my favorite venues of all time, not just because it's in my own back yard but because I have a lot of history at the hall." In fall of 2014 Lightfoot was awarded the inaugural Massey Hall Honors Award for having played the venue 152 times over the past five decades. "Like I said, I've performed there many times." After five decades of hitting the road Lightfoot concedes he has the taken a technical approach to touring. "To me it's a very scientific process, from how and what to play to being on time." He takes pride in his professionalism. "I've always been well prepared and very punctual." He attributes his steadfastness to his work acumen. "There is something to be said for being older and wiser." Success initially came easier in his home land than it did in the United States. "I did five albums for United Artists and was gaining continued popularity in Canada. In the states I was earning more credibility as a songwriter with many popular artists at the time wanting to record my songs." The list is a who's who of early rock n' roll including Elvis Presley, Judy Collins, Johnny Cash, Peter, Paul & Mary, Richie Havens, and the Kingston Trio. Presley found hits with "Early Morning Rain" and "For Lovin' Me". "I felt honored other established artists wanted to record my songs. Anyway you look at it I was making a name for myself in the industry." Lightfoot says he sometimes likes his songs by other artists more than his own version. "I have a personal connection to all of my songs but I really like what Elvis did with "Early Morning Rain". It has such a smooth feel to it. Obviously he was meant to record it." Following in the footsteps of Peter, Paul, & Mary, Bob Dylan, the Band, Janis Joplin, and many others Lightfoot was managed early in his career by famed folk rock entrepreneur Albert Grossman. "He certainly knew the business. He was very intuitive when it came to folk music and artists on the verge. He had a good ear but an even better business sense." Lightfoot was introduced to Grossman through Peter, Paul, & Mary who had one of their first hits with a song penned by Lightfoot. It was in Grossman's Woodstock, New York home in 1965 where a then 26 year old Lightfoot met Mr. Dylan. "Bob and I met in Albert's kitchen. Bob was making a sandwich. I said I admired his songwriting and what he was doing and he said he liked my songwriting as well." To this day Dylan lists Lightfoot as one of his favorite all time performers and regularly includes "Shadows" in his set. Other established artists that perform his songs today include Paul Simon and Billy Joel. "Like me these guys are veterans. I'm proud they like my songs well enough to add them in their sets." It wasn't until he moved over to Warner Brothers Records that Lightfoot began to crack the American charts as a solo artist. "1970 and '71 was a pivotal time for me. "If You Could Read My Mind" was a big hit and really started to get the ball rolling for me." The single peaked at number five on the Top 40 charts eventually selling over a million units. "Obviously it brought my music to another level and to folks that may not have heard of me until that time." Regular chart success and touring would continue throughout the mid 1970's. "It was a very busy time for me back then. I was either writing, recording, touring, or doing television." Lightfoot never fell prey to drugs but did have a problem with alcohol. "I drank way too much. But I gave that up in 1982 thanks to the help of my sister and a bad breakup. I knew I had to quit too keep myself sharp and stay in the game." To his fans and many of his contemporaries Lightfoot is a modern day legend but the man himself shies away from such praise. "The term legend is overused way too often. I've certainly been around a long time and been at it now over 50 years but I don't consider myself a legend. I'm a guy who likes to sings my songs in front of people who want to hear them. I work at what I do and I enjoy it." Having been around as long as he has been Lightfoot has seen several changes in the music industry. "The technical advances have been good." Although he sees a lot of talent on the horizon he thinks it's harder to make it today. "There's a lot of competition out there." Worlds apart from current teen idol and fellow Canadian Justin Bieber, Lightfoot appreciates Bieber's efforts. "Some time back I listened to his first album and it was good. The production and vocals were better than I had imagined. And I believe he was helped out by the internet. So that's how things have changed over the years. The bottom line is you still have to have a measure of talent or something an audience wants to hear. Maybe that's why I've managed to hang around as long as I have." So what can fans expect when Gordon Lightfoot takes the stage? "I have 10 or 12 standards I play in every show I perform. I know fans come out and want to hear the songs that still get played on radio. I'm happy to oblige because I still enjoy playing them. Other than that we rotate some songs in that fans may or may not remember like "Rainy Day People" or "Blackberry Wine". The main thing is we know what we're going to do when we get on stage. That's the scientific element of my life now." Lightfoot travels with about 15 people on a regular basis. "We try to keep it as simple as possible. We go out do our shows for a few weeks and after that we all go home to our families for a few weeks. It's a good rhythm. I'm just grateful I can still do this at 76. I enjoy the people I work with so that makes it more fun." Charleston fans can witness the sounds of Gordon Lightfoot when he brings his "50 Years On The Carefree Highway" show to the Charleston Music Hall on Monday February 16th. "I love Charleston. I love playing in the south. I still perform more shows in the United States than I do anywhere else." Show time for the music hall concert is scheduled for 8pm with tickets still available. "You know it will start on time because I'm always punctual."